The experts at Zenput revealed in a recent study that, behind the food, a restaurant's cleanliness ranked as the most important quality. You can count on the loss of customers if your restaurant remains dirty or grimy. To combat the buildup of grime and grease around your dining areas and kitchen, you can count on the efforts of our professional team. You can reach us anytime at 254-716-8685 should you need our help with restaurant pressure washing in Waco and Temple, TX. According to NFPA (National Fire Prevention Association) 96, restaurants cannot have grease or gum build up on the hoods, vents, ovens, or other cooking areas. Therefore, it’s a good idea to clean these areas about every 3 months in order to ensure they are compliant with regulations. This can be a very messy, sticky, time-consuming job that must follow certain cleansing, drain, and even disposal requirements to the letter to avoid penalty. Our professionals can provide extensive restaurant pressure washing in Waco and Temple, TX that follow state, city, and NFPA guidelines and leaves your restaurant looking and feeling like new. The kitchen is the heart of every restaurant and can make or break your food quality. Clean, grease-free equipment produces lighter, better-tasting food that your customers will appreciate and return to get. Let our technicians clean all of your kitchen’s equipment including your oven, hood, fryer, and walls and floors to eliminate grease and build up and leave your kitchen revived and clean. The exterior of your restaurant is the first thing your patrons see. When your parking lot, sidewalk, or outer walls are looking grim and grimy, your patrons may feel put off and not very welcome. Others may take it as a reflection of the food quality and write off your restaurant before walking in the front door. Combat these restaurant woes with a comprehensive exterior cleaning by our professionals. Our restaurant pressure washing in Waco and Temple, TX removes grime left by vehicles and traffic, graffiti and dirt from the exterior walls, and gum, debris, and stains from your sidewalk. Over time, your tiled dining area can become dingy and worn. 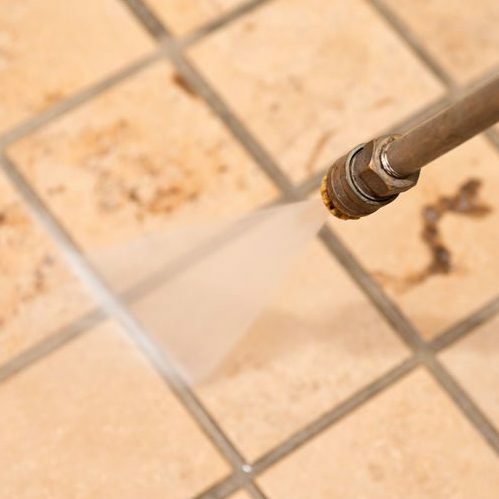 Our professional pressure washing services can restore your flooring to its original luster and remove the grease and buildup that causes foul odors and slippery floors without damaging your flooring or wall paint. Don’t let grease and grime get you down. Call our professionals when your restaurant needs cleaning for knowledgeable service that follows all NFPA, state, and local guidelines to ensure your restaurant’s cleanliness and code compliance. When you need reliable restaurant pressure washing in Waco and Temple, TX, call our technicians at 254-716-8685 to schedule your restaurant evaluation. Updated on March 21, 2019 at 1:47 pm by eSquared Asphalt Maintenance.